Infor, a leading provider of micro-vertical application suites, has introduced DevOps as part of an initiative to migrate its enterprise application suites to a cloud platform. The significance of this should not be lost. Infor is not a young, Web 2.0 unicorn that was born with DevOps DNA. Infor is a 14 year old privately held software supplier with over 70,000 customers across multiple micro-vertical markets. Infor’s industry-specific applications are mostly deployed and managed on-premise. The move to a cloud based AWS platform is as much of a paradigm shift for Infor as it is for its diverse customer base. “Our DevOps team worked closely with the development and cloud operations teams to develop standards for the cloud. Further, they were responsible for setting and maintaining the cloud standards including the development of architectural components that allowed for the automation of provisioning, patch processing, upgrades, backups, restores, monitoring and the development of a portal to provide a self-service option for these functions,” Rose explains. 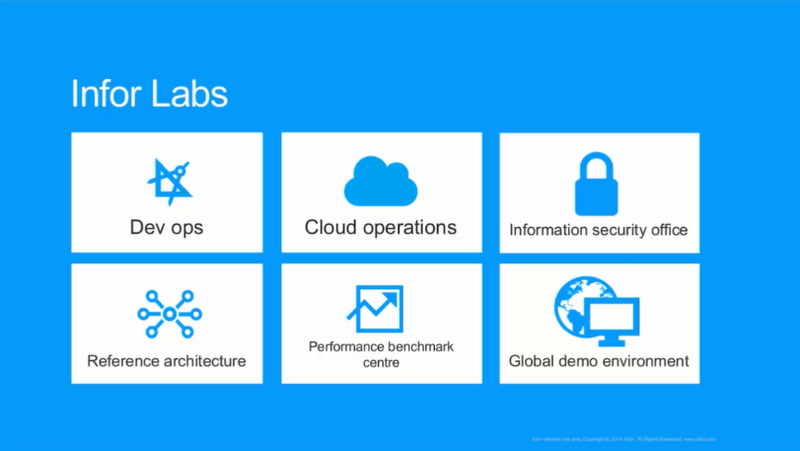 Infor Labs has already seen results from DevOps. “The benefits that we have experienced include the reduction of the provisioning of an industry suite from weeks to minutes, decreased implementation time and costs for our customers, and solutions that are optimized from a technical ops perspective that allow our cloud infrastructure to scale so that we can support the thousands of customers that we have today in the cloud and the ability to scale to support the thousands more that we see moving to the cloud in the future, ” says Rose. While DevOps is not intended solely for applications in the cloud, software providers such as Infor that publicly promote the value of their own DevOps culture increase proof of concept while serving as role models for their enterprise customers. If the primary objective of DevOps is to improve speed to market and time to value, who better than a trusted commercial software provider to demonstrate real world insight and results.